With a good explainer video script, and creative direction, you can tap into the power of storytelling. The story in your explainer video must focus on your target audience and on how to solve their problems. Your brand should show up afterwards, as the hero that saves the day. 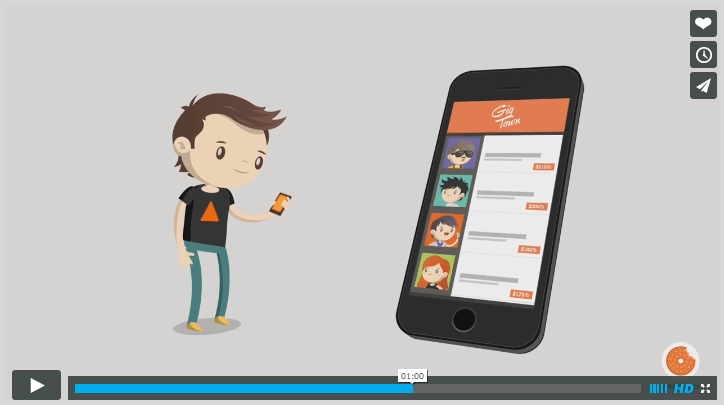 Animated explainer videos are popping up all over the place. No longer do you need a big budget and endless man hours to produce one. Today it is much easier. Ok so they aren’t hard to create, but what is the point of making one in the first place? What will they do for your brand specifically? 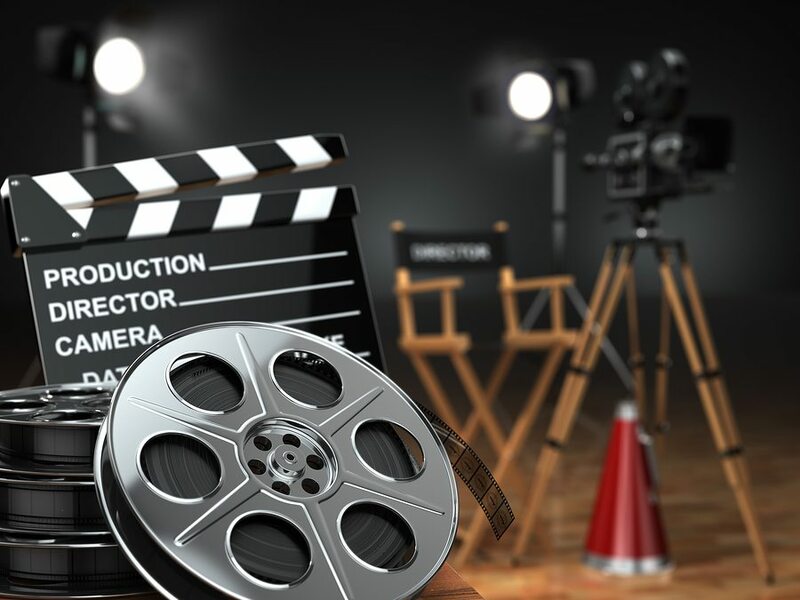 Explainer videos are a great marketing tool that can reveal any type of product or service in a quick and entertaining way. Many marketers consider these videos a must have for a startup or online business. Not because they just explain stuff; but because they create buzz for your brand, help you standout from the crowd and educate your audience about what you do. Here’s the thing: everyone can create these things pretty easily now. This means to make an impact on your audience, creating one isn’t enough. You need to find a new level of quality. The whole idea of brand awareness is to make people recognize and recall your brand when it’s mentioned or when the brand logo appears anywhere on the web. From the very first advertising strategies unique colors have been used to grow brand awareness. More than a Century ago, Coca-Cola decided to change the green colors of the original Santa Claus into the red and white of their brand. Now Christmas (Yes, the whole idea of Christmas!) is red and white thanks to Coca-Cola. Shocking, huh? 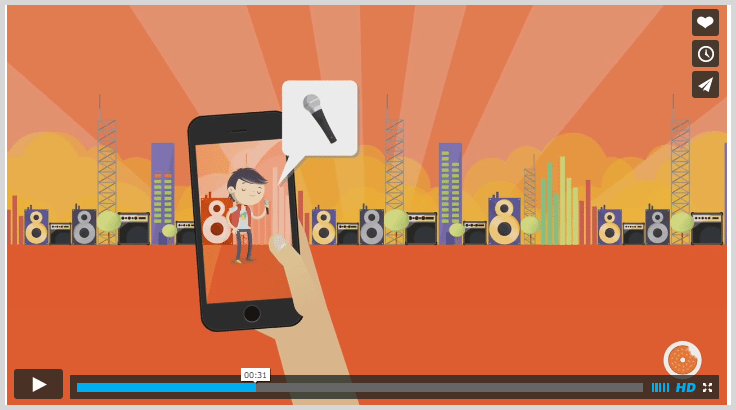 In order to grow brand awareness with an explainer video, you need to leverage your brand colors as much as possible. Then, after watching your video, people won’t just recall the fun story, they will create a connection with your brand colors. 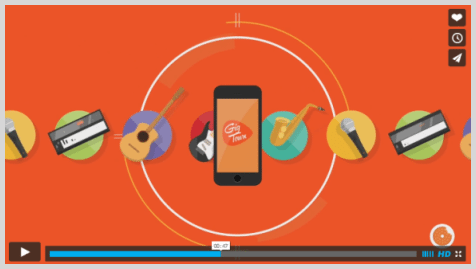 Brown, orange, black and white – Gigtown’s colors. 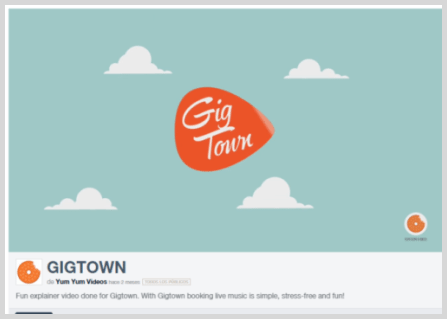 Now let’s analyze a few branding details from the explainer video that you may have missed, but Gigtown have deliberately included to create a subconscious connection to their brand. 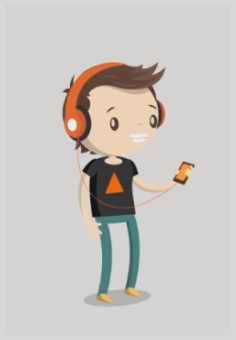 Below, the t-shirt and headphones of the character are colored with a particular combination of orange, black, brown and a sprinkling of white. That wasn’t a random decision: those are the main colors of the brand. Now check the backgrounds and visual elements on different segments of the same video. Everything is driven by the same combination of Gigtown’s color pallet. Again, coloring makes it easier for the viewer to link the explainer video with the brand, and also make them recall the video (even weeks after watching it) when bumping into the company’s logo on the web. Brand awareness is a fundamental part of your audience’s purchase decision. 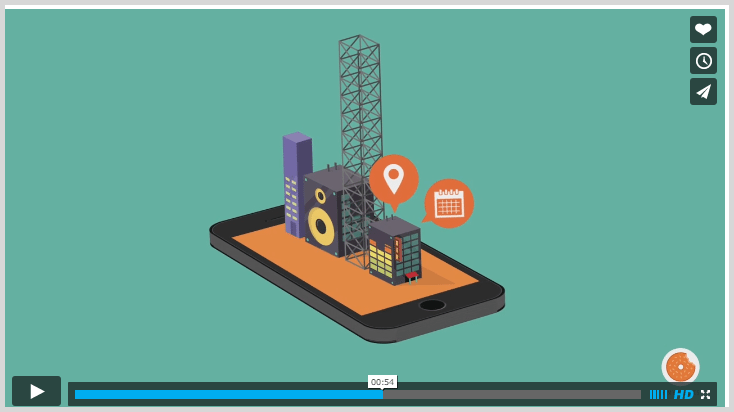 Luckily, explainer videos are here to make the recalling part easier for you. It’s not enough for customers to learn to recognize your brand; you need to build trust with them because brand trust is one of the main purchase decision factors and that road is the one that leads to the highest prize in marketing: brand love! 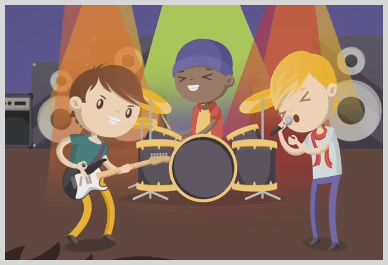 In order to grow trust within your audience and prove that you really care for them, you need to show that the service you’re promoting with your explainer video has been specially made for them, and the best way to do this is by creating animated characters that look like your potential customers. 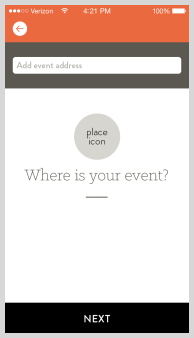 Gigtown is a mobile app made to discover, contact and book local musicians to play in venues. So the video has two different target audiences: the musicians and the people who book them. Both target audiences are mostly men (and, to a lesser extent, women) from the USA, between 20 and 35 years old. They’re mobile users that love to listen to music and attend rock concerts; they’re unstructured and play it cool. 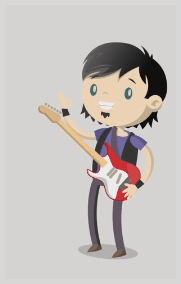 You can see how every animated character in the explainer video is based on Gigtown’s target audience. The only one that differs is the bad guy: the evil middleman that wants to scam the main character. Again, all of these customer centric decisions must be worked out from the beginning of the explainer video production process. As you can see, the target audience (20-to-35-year young rock fans) has the main role in this video and they always show up in a cool way with some great custom designs. All of this grows trust and brand love within the audience because they feel that the brand truly gets them. It seems like a simple statement, but it’s a powerful marketing move. But that’s not all; the story has to go the same way. Storytelling is based on explaining ideas through narrative and it’s one of the greatest and most efficient ways of growing brand trust. Remember: your audience must always have the main role. 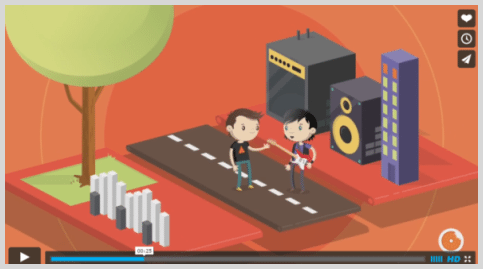 In Gigtown’s explainer video, the brand doesn’t show up until 45 seconds in; that’s halfway through the video! To tie all of these branding tactics together, the animation needs to be outstanding. If the animated characters don’t look alive they won’t grow empathy or identification with your audience. Besides, the whole video would look wrong, get pretty boring, and make people leave in a few seconds. And that’s not a good branding result. Many online companies underestimate animation quality and they go for the cheapest and quickest way. Eventually, these amateur kinds of video (such as template animations) become pretty expensive, because the video doesn’t get the desired results and the marketing campaigns don’t work as expected. Don’t ever forget that an explainer video is made to stand for your brand, so it should stick out from the rest. I hope this has been useful and valuable for your brand. Good luck! via Jeffbullas’s Blog – Internet Marketing.